In recent years the advent of high-resolution and color Doppler ultrasound has enabled a more comprehensive examination of the veins at the cardiac level. These veins include both the superior and inferior vena cava, the pulmonary veins, the azygos vein, the coronary sinus, and the brachiocephalic (or innominate) vein. 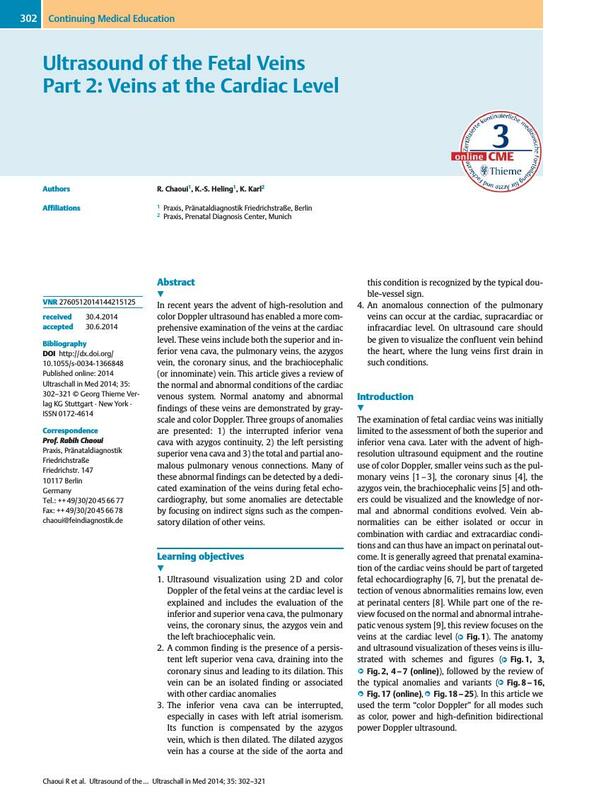 This article gives a review of the normal and abnormal conditions of the cardiac venous system. Normal anatomy and abnormal findings of these veins are demonstrated by grayscale and color Doppler. Three groups of anomalies are presented: 1) the interrupted inferior vena cava with azygos continuity, 2) the left persisting superior vena cava and 3) the total and partial anomalous pulmonary venous connections. Many of these abnormal findings can be detected by a dedicated examination of the veins during fetal echocardiography, but some anomalies are detectable by focusing on indirect signs such as the compensatory dilation of other veins.